STAMFORD – Three students at Bi-Cultural Hebrew Academy-Upper School became filmmakers recently, when they wrapped up a semester devoted to the study of Holocaust history with the production of three documentaries that shed a powerful light on different aspects of the Holocaust. In working on their individual documentaries, the students – seniors Jonathan Agabbs and Ella Feuerstein and sophomore Joshua Terr, all of Stamford – were aided by IWitness, a unique program created by the University of Southern California’s Shoah Foundation. Using the IWitness program, each student created a narrative that was augmented by the first-hand accounts of survivors and witnesses. Through IWitness, the students had access not only to clips of survivor and witness testimonies, but also to voiceover technology. The ability to see and hear survivors tell their stories in their own words made the project all the more powerful for the young filmmakers. “When learning about such a traumatic time in history, it was nice to hear stories of those who survived and those who helped them start again,” said Ella Feurstein of her experience. Students were introduced to the Witness program by their history teacher Zach Smith, who first learned of the program while working toward his graduate degree in Holocaust and Genocide Studies. “These resources make IWitness an unparalleled resource at the fingertips of Holocaust history educators and make these student projects an enriching and immersive experience,” he explained. For the BCHA-Upper School students, the documentaries served as the capstone project of a five-month elective course in which they traced the roots of antisemitism and racism in Europe, the rise of Nazism, and the twisted road to Auschwitz. After completing their documentaries, the students published their videos on IWitness. 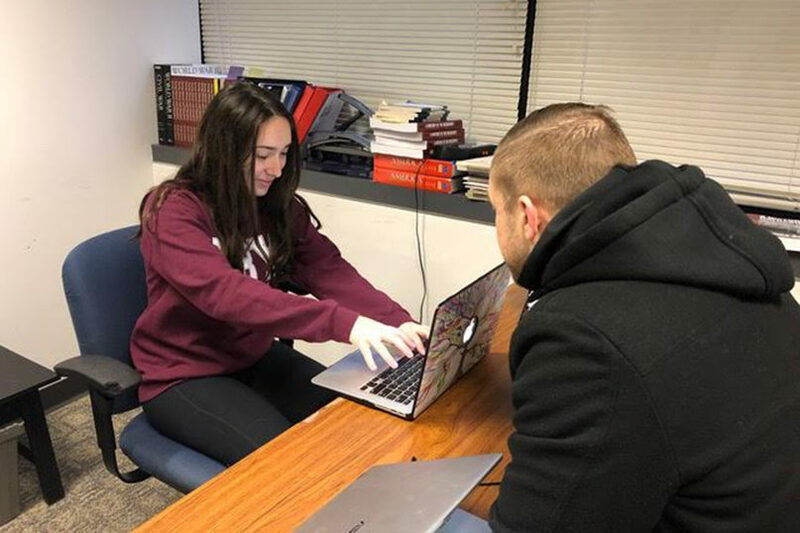 CAP: BCHA Holocaust documentarians Ella Feuerstein edits her film with the help of BCHA-Upper School history teacher Zach Smith.